Get Paid 8 Ways - Take surveys, do focus groups, watch videos, more. Hey hey, Dollar Goblin here. Today I’m gonna show you eight different ways you can get paid for doing stuff online and in the real world. Best of all, you probably do a few of these things already, like play games and watch videos, so it should be pretty easy to get started! If you’ve spent any time trying to make money online, chances are you’ve considered paid surveys. While they won’t make you the richest goblin in town, if you join the right programs and spend your time wisely, paid surveys can be a good way to make some Starbucks money. My favorite survey program is Springboard America, since I love to argue about politics, and those guys are willing to pay me for my opinion. Mrs. Goblin is a bit of a TV junkie, so she likes E-Poll and Swagbucks since they’ve always got a bunch of fun entertainment surveys on tap. Meanwhile, our buddy Gary Goblin is a survey master and he’s all about MySoapbox these days. According to him, they have more surveys than you can shake a twig at, so there’s always a way to score some points. While you usually earn at most a few bucks doing a paid survey, focus groups can pay much more, sometimes over $100. In fact, our daughter Gabby Goblin once made $75 just to sit in a room and talk about eye makeup for an hour. The downside is that focus groups can be difficult to get invited to and qualify for, especially if they’re paying a lot of loot. If you’re using a program that offers paid surveys and focus groups, your honest and frequent participation in surveys can really improve your chances of getting those elusive focus group invites. Some of the best programs to join if you’re interested in focus groups are Survey Club and Product Report Card, and Gary’s pet-program PrizeRebel has focus groups too. I’d also suggest you poke around on Google to see if you can find some local market research firms that do in-person focus groups. Not only can you make some serious dough, those places always have free peanut M&Ms and other delights. You probably already know this, but websites do a great job of tracking what you search for, shop for, and buy online. Unfortunately, you don’t usually get paid for giving up all this information about yourself. That’s where paid-to-surf programs come in. Basically, they let you earn some coin for monitoring how you surf, so you can get paid for what they learn from you. It’s not a ton of money, but $5 an hour is totally doable if you play your cards just right. Speaking of cards, if you’re ever heading to my college buddy Kevin Goblin’s place for some poker, bring your own snacks because that guy always has the worst stuff. Like, circus peanuts, seriously? Anyway, back to getting paid, if you’re looking to get paid for surfing the web, emailing, clicking ads, and even catching up on last night’s sports scores, Send Earnings and Points2Shop offer some of the best payouts, while Fusioncash and Earning Station have the most different ways to earn. I love writing product reviews. Mrs. Goblin can never have too much skincare stuff. And our kids Gabby and Garth can’t wait to try out new gadgets and devices. That’s why the whole family digs product testing. When you sign up for product testing with places like Toluna or MindsPay, you fill out some information about yourself (always be honest!) to see if you qualify. If you do, companies will send you stuff to try out, then you go online and write a review or answer questions about it. Assuming you’re opinionated like me, you might already be reviewing products like I do… you’re just not getting paid. 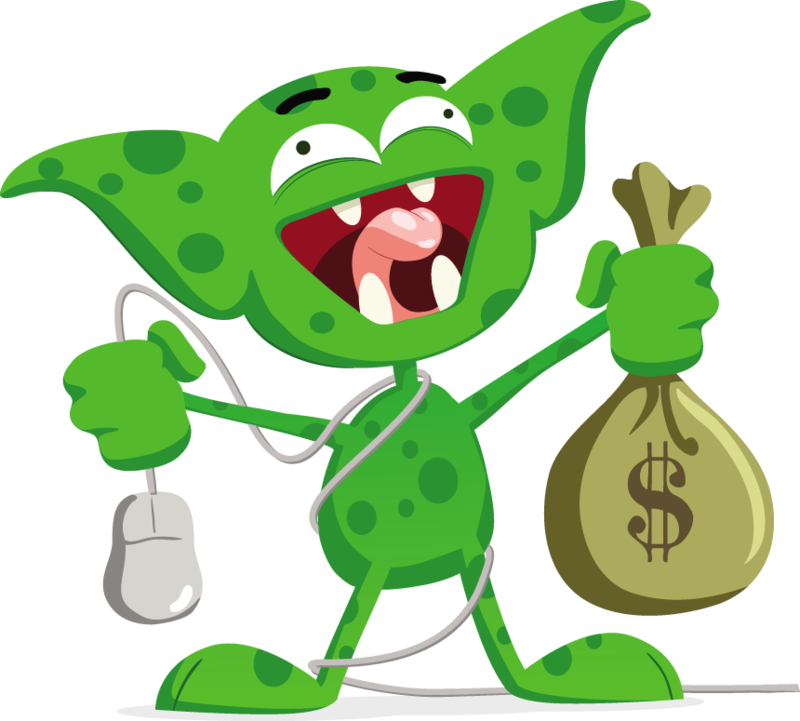 To start getting paid for product testing and reviews, sign up for the two programs above, or you might also look into Jobs2Shop or Shopper's Voice, both of which have earned Goblin Family’s seal of approval. Unlike everything else I’ve been talking about so far, trial offers do require you to spend some money. But, you can usually offset this with earnings if you work the system just right. Usually, the way it works is you sign up for a trial offer to some service, like Netflix, at a greatly reduced rate. Once you stay signed on for a certain period of time, you can earn cash and gift cards. Plus, you get to make use of the service while you’re doing the trial. Most people cancel right after meeting the obligation for the trial offer, but sometimes you’ll find a service worth keeping. That’s how Garth ended up in that Beef Jerky of the Month club he loves so much. If trial offers sound like your thing, two of the best programs you can join are Quick Pay Survey or Cashback Research which should keep you busy for a while. Everyone loves a good mystery. Especially on Scooby Doo when the Goblin turns out to be some grumpy old man. That’s why being a mystery shopper is so fun. Mystery shopping basically means you’ll be doing market research while you’re shopping in a store, only the people working there won’t know it. Once you’re back home, you’ll be asked to take surveys and provide feedback about the store including the products, prices, customer service and more. And once you do that, you’ll get paid. To get started sign up with Jobs2Shop and Survey Downline, both of which have good mystery shopping offers. My friend and neighbor Gary Goblin is always the first to try new ways to get paid, so I wasn’t really surprised when he told me he found a way to get paid to play games. And believe me, a goblin’s brain gets tired after doing too many surveys, so to be able to play games and keep earning at the same time is a real blessing. You’re not going to get paid for playing the latest Call of Duty (sorry, Garth) but do expect to play more simple games like trivia, solitaire, and bingo. You can earn about a buck just for playing 10 games, but some games like TV trivia tourneys at RewardTV give you a chance to earn more based on your skill level. Other than RewardTV, the best programs to join if you’re looking to get paid playing games are Swagbucks, Cashback Fortune, and Treasure Trooper. Sometimes it seems like it’s hard to find a flat surface that isn’t playing videos. From the phone to the tablet to the desktop, people and goblins alike are watching a ton of video. Given that you’ve stuck around reading for this long, I’m sure you can see where this is going… yup, you can get paid for watching videos. One of my favorite spots for paid video watching is PrizeRebel since they’ve also got almost a dozen other ways to earn. Fusioncash and Swagbucks are good for getting paid to watch videos too. In case you’re wondering what you’ll be watching before you sign up, be warned: there are plenty of ads. But, you may also find yourself getting paid for watching movie trailers and sometimes even spankin’ new TV shows. YMMMV. Whooo wee, my little Goblin fingers are tired from typing all that, so I hope you found at least a couple of ways you can start earning some extra money today. Catch you next time. P.S. If you like to make money and haven’t already signed up, scroll down a bit and SUBSCRIBE to my email. I’ll stop by your inbox with money making ideas every day.